You can be upgraded like other technological devices, don’t trust me read this article and decide yourself. Smart people make smart choices so what are you waiting for? The short term courses for developing an area specific knowledge and are under your budget, I meant to say they are cost effective. Relevant information is received by highly professional delegates using interactive workshops supported and guided with practical tools. Most of the programs run only for 90 to 120 minutes. So are you ready for a promotion yes these knowledge snack courses enable you with the skills that make you stand as a highly calibre individual amongst a team. I would define it rather as an upgrading system which makes you the strong candidature in an interview or for a good position boosting your performance. If you want an add-on advantage in your professional or student life you would definitely go for it. Bite size learning deals with short term trainings addressing your needs. You can increase your specific skills as per your capability. It has adaptable feature in your working environment. Bite size e-learning indicates a 180’ turn from boring text-heavy courses to a more dynamic, fun learning experience and greater opportunities for engagement and participation. A bite size course can be accessed in various formats. You can access information on your mobile, which makes life so easy it can be while waiting for an appointment or during a bus journey. The employee is not stationed at a desk at all times so this mobile learning material provides an opportunity for quick access to important job materials, as per your convenience. The other format in form of online training has great potential for increased performance and innovation can be enhanced with the help of internet. Bite size learning through seminars provides quality training for much less than traditional training companies. By using purely electronic means of promotion, invoicing and administration making it flexible and saving your money with the best quality. In my opinion bite size learning is a way similar to traditional learning with a modern approach of e-learning tools using animation, videos and several power point presentation formats suitable for students, entrepreneurs, professional other management and corporate people giving practical, leadership and business oriented concepts. It is also useful for insurance and financial service industry offering coaching sessions along with module theoretical learning. It enables with the best approach with proper plan which can be executed with calculated steps. It involves bestowing knowledge with stormy action. It is also helpful for you if you want to be jack of all trades like you can give time to your hobbies with a professional touch. For example you are a scientist but want to develop some managerial skills you can develop using bite size learning, likewise you are an information technology corporate but have interest in science and its surprising truths and want to gain practical knowledge of some amazing devices used in medicine industry or by astronomers than this can be very informative. 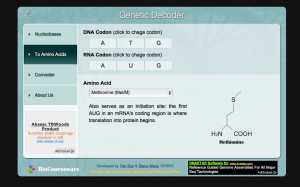 Or you want to quickly grab the idea of DNA genetic coding, our bite size web app- Genetic Decoder immediately help you to connect the biological theory and application with key concepts of genetic coding and a free web app online tool to translate any format of DNA or RNA into protein sequence. This entry was posted in Education and tagged bite size learning, genetic coding, web app on September 15, 2013 by touchapp.